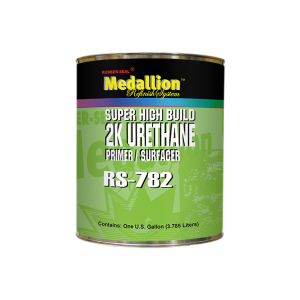 When you need the ultimate high build primer, reach for 2K Super High Build Primer Surfacer. RS-782 has excellent sanding and holdout properties. It fills deep sand scratches and when used properly, this primer will not leave rough featheredges, ringing or lifting. Excellent for all surfacing work under urethane finishes. Mixes 4:1 with RS-783 activator and National Rule compliant. Available in gallons only.